LIVE LIKE YOUR ON VACATION! 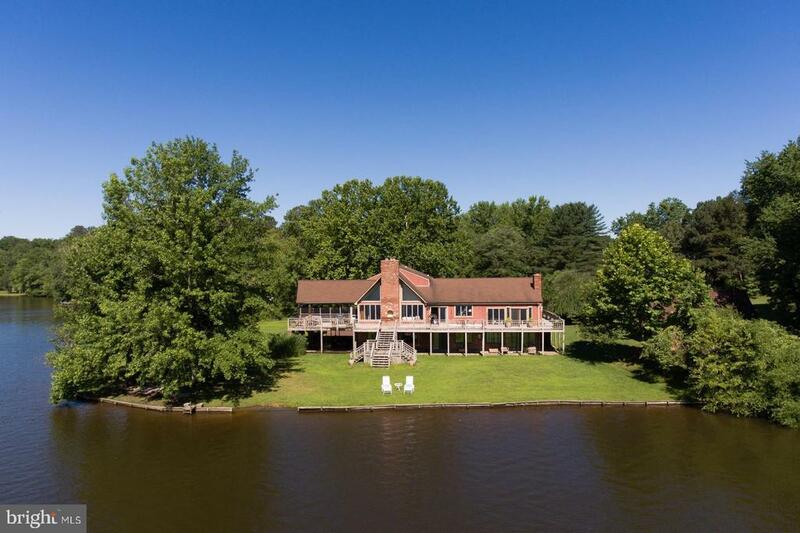 Custom Home on Four Lots totaling approximately 2.1 acres with 550 sf of water frontage. This approx. 5, 000 sf unique home offers an open floor plan with walls of over-sized windows to display the lake view throughout the entire first floor. A three-sided deck with screened-in porch are also available to watch the beautiful sunsets. Indoors you will find four fireplaces, a pantry system with pecan wood cabinets, Corian countertops, custom table, Jenn Air Grill, hardwood and ceramic floors, etc. An amazing 8 wide oak spiral staircase leads upstairs to the Master On-suite. Two additional bedrooms are located on the main level with another two more bedrooms on the lower level. The walk-out basement also provides a huge recreation room with bar, refrigerator, sinks and cabinetry -- can be used as a potential in-law suite. The detached garage has second floor storage and work space. Property can be subdivided with 1/2 acre lot (#607) previously perced . Tons of amenities in this Gated Community. Be sure to check out the VIDEO and SPECIAL FEATURES document. Directions: I-95 to Exit 110 (Ladysmith). Right onto Ladysmith Road for approximately 3 miles. Right onto Land Or Drive & Guard Gate. Wind around Land Or Drive to Norgate. Home on Right.